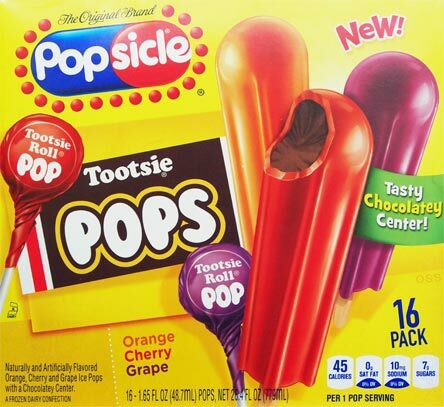 [New for 2015] Popsicle puts out a few new products every year and while I don't usually rush to try them, these new ones seem pretty unique. Whoa, wasn't expected to see the chocolate sticking out the bottom. 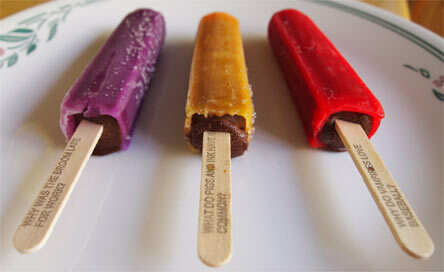 I realize that they need to put the chocolate on the stick first and the popsicle shell on after, but iunno, guess I envisioned a complete wrap. No big deal, just funny to see. 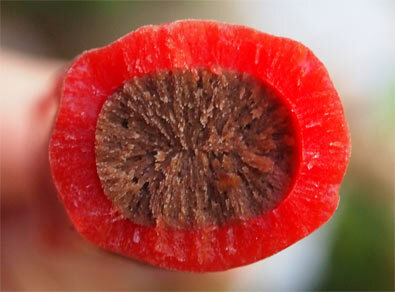 Yes you could treat it as a regular popsicle and work your way down to the fudgy core, but what fun is that? I bit mine so I could taste the flavor combo. Yeah, I don't know why you would want this. Seriously, I don't get it. I mean it's a great gag, you know, fun factor and all, but this doesn't work for me at all. Just not a fan. I think it's texture more than flavor that is bugging me. I continue on a bit and the outer popsicle shell breaks off. That's annoying, but at least it gives me a chance to try the filling. I try to savor it, you know, let it melt a little so it's more like a pudding pop, but I still don't like it. It has that air of familiarity to a tootsie roll, but it's just not making me happy in anyway. I'd rather just have a real tootsie pop. As you might suspect with a plate full of popsicles, I brought reinforcements on this one. It was going ok but after a bit, my daughter got to the filling. About half way through she goes "yeah, this was just a bad idea". She loves popsicles but she doesn't get it either. Thankfully she has offered to try and finish off the box but we won't be picking these up again. Dubba's Verdict? Why would I want this? They don't even look appealing in your photos. Bummer. The idea sounds good but turned out a flop. Are you going to try "jelly belly" variety next? They have a new one now with mystery centers. Not a huge jelly belly fan, though I know it's just a name... I guess I worry about the consistency of the filling now that I've had these. Oh my gosh, how cute was that comment by your daughter! She is absolutely right; not a good idea. These should be on clearance very soon.